At Oulton, we have a rich and varied curriculum. Below is a brief synopsis of each subject and details of any schemes followed. At the bottom of this page, you will find a breakdown of the curriculum for each KS1 and KS2 year group. We follow the National Curriculum for England. For more details please follow the link below. We use the Maths No Problem Primary Maths Series from Year1 to Year 6. It is a child-centred approach, which is fun to teach, using physical resources, problem solving and group work. The series is fully aligned with the national curriculum. Today, maths textbooks based on the Singapore Maths approach are being used in thousands of schools across the UK and have been widely adopted by the Department for Education’s Maths Hubs. Alongside the textbooks and workbooks, children use maths jotters. Parents’ Videos can be found by following the below link. We use the Maths No Problem Primary Maths Series from Year1 to Year 6. Parents’ Videos can be found HERE. We place a huge importance on spoken language at Oulton Primary School. We want our pupils to be effective communicators with an ability to articulate their opinions and views. Pupils are encouraged to ask questions to help them extend their understanding and knowledge. The link between spoken language and writing is an important one and we believe that being strong and effective communicators will support us in becoming resilient and confident writers. We aim to develop pupils’ abilities within curriculum of Spoken Language, Reading, Spelling and Grammar & Writing. Pupils are given opportunities to develop their use, knowledge and understanding of spoken and written English within a broad and balanced curriculum, with opportunities to consolidate and reinforce taught literacy skills. There are many opportunities for reading in school which include: phonics, guided reading sessions, group reading with their peers, sharing a class book and individual reading. Reading also takes place through book groups such as the Leeds Book Awards. In KS1, pupils have access to a range of both phonic and sentenced based reading books (from a variety of different schemes) to enable pupils to broaden their reading experience. Spelling work is focussed around the rules of spelling. Pupils are given rules and examples to learn and apply rather than weekly lists of words. Alongside these rules pupils also need to learn the required word lists, as set out in the National Curriculum. Discrete phonics sessions are taught in Nursery, Reception and Key Stage 1. Children in Reception and Key Stage 1 work in ability groups in order to maximise progress. Phonic lessons follow the revisit/review, teach, practise and apply model. In Key Stage 2, phonic sessions are replaced by discrete SPaG lessons, however phonics work continues for those children that still need it. This is often part of intervention or IEP work. We follow the Letters and Sounds scheme of work up until Phase 4. It is our aim that children leave Reception working within this phase. When they join Year 1, children work to secure the Year 1 objectives set out in the National Curriculum for word reading and vocabulary, grammar and punctuation. Once in Year 2, children work to secure the National Curriculum Year 2 objectives set out in the National Curriculum for word reading and vocabulary, grammar and punctuation. The objectives for both Year 1 and Year 2 are further supported by the statements in Appendix 1: spelling and Appendix 2: vocabulary, punctuation and grammar. Although the Letters and Sounds scheme of work is not followed after Phase 4, many of the activities set out in this document are used to support the teaching of the Year 1 and Year 2 National Curriculum objectives. Children who are considered to be working below age related expectations in phonics are given additional support. This may take the form of a small group intervention or individual IEP work. Interventions such as Alphabet Arc are also used to support progress in phonics. In order to achieve the writing outcomes, we work through varied activities such as reading, drama or speaking and listening activities. Pupils are given opportunities to be involved in shared writing as a class, small group writing and independent writing. We aim to develop the children’s technical skill in writing alongside their creative abilities, engaging them in the processes of writing as a reader as well as considering their audience. We use Snap Science from Year 1 to Year 6, which explores objectives within the National Curriculum. Science education provides children with a greater understanding of our world. At Oulton, we seek to cultivate a spirit of enquiry in our pupils through practical exploration and investigation activities. There is a large focus on the children learning to work scientifically, which includes observing over time; identifying; classifying and fair testing. Our Science curriculum teaches children skills for life such as perseverance, problem-solving and researching. We encourage children to form their own opinions, rather than taking those of others for granted. The use of computing is an integral part of the school life and is a key skill for everyday life. Computers, tablets, programmable robots, the internet, digital cameras and recorders can be used to acquire, organise, store, manipulate, interpret, communicate and present information. As such, Oulton primary school recognises that its pupils are entitled to quality hardware and software and a structured and progressive approach to the learning of the skills needed to enable them to use it effectively. We follow the National Curriculum and this is structured using the school’s bespoke computing scheme of work which is supplemented by ‘Switched on ICT’ resources. E-Safety plays a central role in each unit and year groups have specific E-Safety content; it is expected that safe and responsible use is at the heart of every computing lesson and actively promoted. We provide a broad and balanced Religious Education curriculum, underpinned by essential skills which help equip our young people for adult life and lifelong learning. Planning for Religious Education is based on the Leeds Agreed Syllabus, a document which aims for pupils to develop as tolerant young people with respect and understanding of the views of others, including the beliefs and practices of religions and other world views. Through their study of RE, our pupil’s will gain a greater understanding of the identity and diversity of their local community. Teaching and learning is focused around investigation and challenging children to reflect on key questions which are relevant and engaging. They will also have the opportunity to study religious and non- religious approaches to life as well as explore personal questions. History teaching encourages our children to begin to think like historians. A variety of strategies and approaches are employed to engage and motivate our children. Planning for History is based on the skills that are detailed in the National Curriculum for Key Stage 1 and 2, and in the Understanding of the World aspect of the Early Years Foundation Stage Framework for EYFS. We place an emphasis on examining historical artefacts and primary sources where possible. Where it is appropriate, our children are offered the opportunity to visit sites of historical significance. We encourage visitors to come into school to give our children the chance to experience living history days. We help the children to interpret historical events and they are encouraged to ask questions of what they are studying. In the Early Years Foundation Stage, PSHE is taught through a themed approach in line with the prime area of learning: Personal Social and Emotional Development. It is divided into three strands, Making Relationships, Self Confidence and Self Awareness, and Managing Feelings and Behaviour. Our children begin to explore simple PSED concepts in Nursery and by the end of the EYFS, our children are expected to have met the following Early Learning Goals. KS1 and KS2 are using the Leeds Primary PSHE scheme of work to support our teaching. This scheme itself is a spiral curriculum within school and covers SRE, drug education, citizenship, financial capability, behaviour and safety, mental health, healthy eating and physical activity. We use the scheme to help deliver a need led curriculum which will enable pupils to develop the knowledge and skills needed to make safe and healthy choices. We provide the children with an enriched curriculum that motivates the children to develop these skills and to become confident Geographers both inside and outside of the classroom. This has included residential trips, local visits and local walks. To ensure learning remains motivational and contextual, we offer a cross curricular approach which entails integrating the Geography objectives outlined in the National Curriculum into other subjects, when appropriate. We offer a whole school Geography challenge each term which is pitched against the Geography curriculum aims, outlined in the National Curriculum for Key Stages 1 and 2. The previous challenges: Location, Location, Location, Euro 2016 and Disney/Pixar movies encouraged the children to develop their Location and Place knowledge. Other challenges such as ‘Magnificent Mountains and Volcanoes’ encouraged the children to understand the Human and physical geography of the world. We have been overwhelmed with the imaginative projects and research that the children have produced such as non-fiction books, models and posters. Keep a look out for the next Geography challenge coming soon. We use the Real PE scheme of work for children from Year 1 to Year 6 which is based around the National Curriculum. It is a skill-centred approach that involves pupils of all abilities and encourages progression at all levels. Alongside the Real PE scheme, competitive games are still taught throughout school. These include a wide range of sports from cricket to netball. 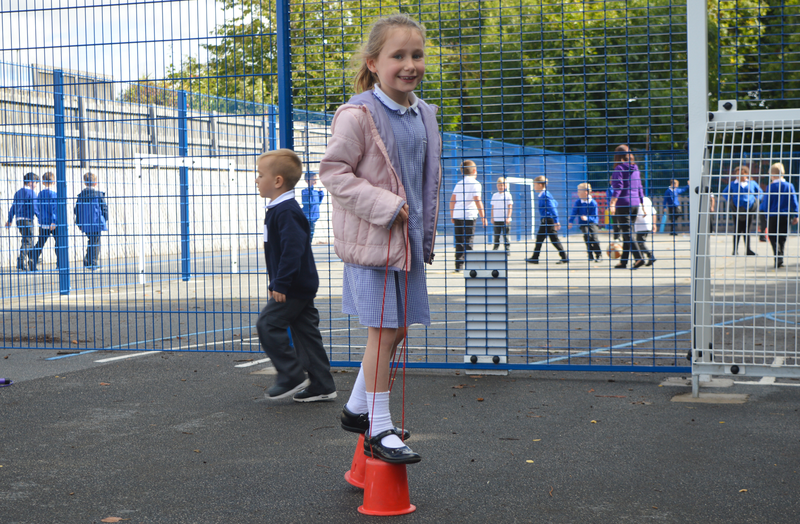 All children are given access to two hours of PE per week. At Oulton Primary School we plan for art based on the National Curriculum for Key Stage 1 and Key Stage 2, and in the Expressive Arts aspect of the Early Years Foundation Stage Framework for EYFS. Children are assessed in art against the statements in the National Curriculum. Art, where possible, is approached in a cross curricular manner and linked to each year groups topics. A high-quality art education should engage, inspire and challenge pupils, equipping them with the knowledge and skills to experiment, invent and create their own works of art, craft and design. For Design and Technology, we follow the National Curriculum throughout school. D&T is often linked to our topics, where possible. Our D&T process usually follows a design, build and evaluate structure. Children are assessed against the statements in the National Curriculum. At Oulton we use the “Inside Music” scheme to deliver the music curriculum throughout school. This uses the Kodaly method, which is to deliver the curriculum through singing. The children learn many songs and use them to investigate the musical elements of rhythm, pitch, timbre, composing, improvisation and listening. By the time children leave our school they can sing and sign in tonic solfa, compose their own simple pitched tunes and are able to write them, using musical notation. At Oulton we learn Spanish as our modern foreign language, and deliver this using the “La Jolie Ronde” Spanish scheme for years 3-6. The children speak, read and write Spanish from the very beginning and by the time they reach Year 6 they can introduce themselves, tell people about their likes and dislikes, pets, family and they can also order in shops and restaurants and find their way around a Spanish town. Although it is not required for children to learn a foreign language in Key Stage 1, we use the Little Languages scheme to give the children the opportunity to learn simple words such as how to say hello, count and know numbers in several languages. This makes them aware that other languages exist and prepares them for the fun to come in Key Stage 2!